Following the news today that over 200 people lost their lives when an 8 story clothing factory collapsed in Bangladesh, it’s perhaps time to re-examine the ethics of our throw-away fashion culture. One of the companies that this factory produces clothes for was Primark, famed for it’s amazingly cheap fashion finds. I’ve never bought from Primark (or Primani as it’s referred to by some mums I know), although to be honest this is mostly because it’s inconvenient. There isn’t a Primark on my local high-street and they don’t sell online, where I do most of my shopping. It’s also perhaps unfair to just single out Primark, the high-street is littered with cheap throw-away fashion, just look at Wall-Mart, H&M and Tesco just to name a few! I choose not to buy disposable fashion for myself (I learned the hard way that if buy a cheap T-shirt it will just look cheap) but I do sometimes buy cheap children’s clothes. At the rate my little boy grows (and gets through the knees on his trousers) it seems mad to buy expensive clothes for him, especially when he just wants T-shirts with cartoon characters on the front anyway. So while I don’t buy from Primark, I do buy him clothes and school uniforms from supermarkets. What price are we really paying for cheap clothes? I don’t advocate buying cheap throw-away fashion, and the first reason is because it all just seems *so* wasteful. It’s one thing if you’re struggling to clothe your family on a really low income, in which case Primark is probably a godsend, but they aren’t the consumers that worry me. I have some fast-fashion junkies amongst my friends, and they will honestly admit that they end up only wearing their junk clothes once, or not even at all! This means that the cheap quality never really becomes an issue because you don’t even get to the stage where you need to wash the clothes! If you want to read more about how fast fashion manufacturers are skimping on quality read this article by Couture Allure – it’s a real eye-opener! There are also the ethical and environmental concerns which make me as uncomfortable as the waste and lack of quality. While companies like Primark talk big about their ethical trading policies, this is soured by rumours that the owners of the factory in Bangladesh ignored warnings not to allow their workers inside after cracks were noticed on Tuesday. How much of this was because of the greed of the factory owners and how much was due to pressure to deliver product from their European and American customers? I wonder how many Primark buyers are questioning their purchases after hearing about this tragedy? There are over 4 million workers in the garment industry in Bangladesh, and I’m not suggesting we shouldn’t support this industry, but what effect is our demand for ever-lower prices having on working conditions and safety? Choosing vintage over new clothing will lessen your carbon footprint and reduce the amount of trash dumped into landfills. With only 20 percent of textile waste recycled every year, buying secondhand goods, like vintage, is your small part to help improve the environment. Also, since a new garment requires additional energy to produce and ship from overseas, purchasing vintage requires less fossil fuel and thus slows the effects of global warming. So what are the alternatives to fast fashion? 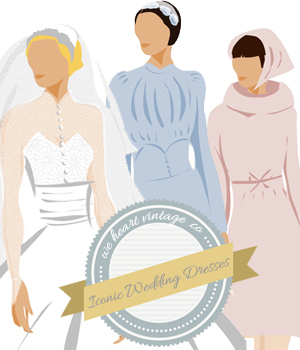 Vintage is a great way of buying great quality clothes at a very reasonable cost. Clothes from the 1960s (for example) which have lasted until now are much better quality than anything you’ll buy in a supermarket, and if you know where to shop you can buy vintage for a great price! I’m a great believer in buying fewer items but getting something really gorgeous that will stand the test of time. These investment pieces really do pay for themselves in the long run. You don’t need to buy designer, just make sure you’re buying something that’s made well from quality materials. All shops have discounts and sales, and I try to buy one or two quality pieces whenever the big sales are on. This way you can afford something which is beautiful quality and which you’ll love but up to 75% off the retail price (if you’re lucky! ), so you get great quality at (almost) throw-away prices. When was the last time you sewed a button on, or fixed a rip in your jeans? You might be one of the few people who do actually mend clothes, but I know I’m terrible for it. I’ve got a gorgeous cashmere jumper which had a moth hole in the arm. It only took me 5 mintues to fix, but it took me a good 6 months of procrastinating before I got around to it! I also love the idea of adapting and making clothes, but I haven’t quite got to that stage yet. What do you think? Do you have a guilty fast-fashion secret? I’d love to know what you think about this! One of my goals this year is to put more thought into the clothing I buy. I love vintage clothes but have had a recent spate of bad luck with odors. I had to throw away a beaded sweater because the mothball smell was intense, and I bought a beautiful raw silk dress from the 1920s that I can’t get clean. I love the idea of wearing recycled clothes but I’m discouraged at the moment. On a happier note, I’ve been mending my clothes and getting better at it. I also had a cashmere sweater with a hole in it – I fixed it up and hope to wear it for a long time. Buying vintage things can be tricky, but don’t be put off I’m sure there are some good tricks for getting rid of bad odors in vintage clothes, I’ll see what I can find out for you! What are you trying to get out of the silk dress, is it a specific stain? It’s a satisfying feeling mending clothes isn’t it – I don’t know why I procrastinate so much about it! Thanks, Mary. The silk dress has a body odor smell that I didn’t notice till I’d worn it for a few hours at work. I soaked it for about 15 minutes in OxiClean which helped a little bit. I’ve read that spraying vodka on it will work and have also read a vinegar soak will work. I just don’t want to ruin the dress but I won’t wear it now. Ha! I’m a bit of a procrastinator too! The disposable fashion trend wont last forever. Times they are a changing.